X. Let’s start this off with a look at a couple of new projects that will be coming forward to the city of Ithaca Planning Board later this month. The first is 815-17 North Aurora Street. Back in June, when the existing property went on the market, I noted that zoning could conceivably allow the dilapidated house currently on the lot to be taken down and redeveloped into two two-family homes. Lo and behold, that is exactly the plan. Although the listing has been pulled, no sale has been completed, so it’s not clear what kind of premium they are willing to pay for a double-lot development opportunity in trendy Fall Creek. 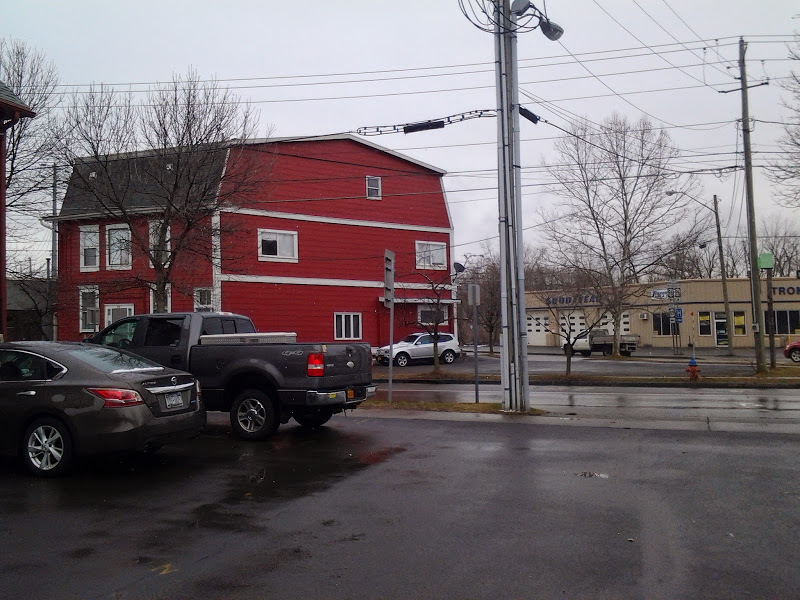 But thanks to the Site Plan Review (SPR) documents, we at least know who the pending owner/developer is – the Stavropoulos family of West Hill, who own the State Street Diner and a growing portfolio of rental units under the name “Renting Ithaca”. 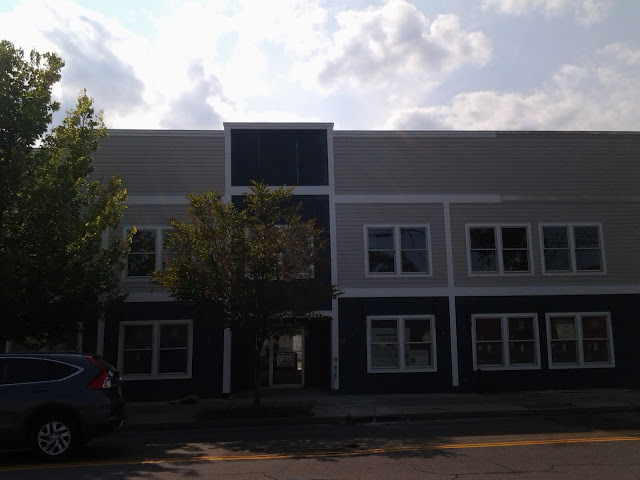 The Stavropoli have redeveloped several properties in the past few years, including 1001 North Aurora Street (4 units), 107 South Albany Street (11 units), a two-family home at 514 Linn Street and a two-family unit planned for 209 Hudson Street (they originally applied to build two two-family buildings, but reduced it to one after neighborhood pushback). Their M.O. is basically small-scale rental infill, nothing especially large or ostentatious, and with that they go under the radar for the most part. In short, this R2b-zoned site is a perfect fit for them. The plan is to tear down the vacant property, and replace it with two two-family structures, four units total. Each will be three bedrooms and 1,290 SF. Their usual architect of choice, Daniel Hirtler, has designed the structures to fit in with the Fall Creek vernacular, with recessed entries and aesthetic details (such as a transition between fiber cement shakes and clapboard siding) for visual interest. The buildings are positioned so that one is in the front of the lot, one at the rear, and only the front structure is visible from most public viewsheds. The site will include four parking spaces with new landscaping and utilities. Heating will come from electric heat pumps, and while the roofs will be capable of hosting solar panels, those aren’t expected to be included as part of the initial build. LED lighting, energy efficient appliances and water heaters, and high-efficiency spray foam insulation are included. This project would very likely meet the new Green Building Policy Requirements if in place. Given recent news in Fall Creek, it should be noted that the old building does contain asbestos (as do most in Fall Creek), but a demolition/deconstruction plan has yet to be filed. The $627,000 project would be built from January to August 2019, which is a clear nod to having the units ready in time for the next academic year. Fall Creek tends to be less desirable to undergrads at Cornell because of the distance (<1% of total population), but graduate and professional students often rent in the neighborhood (~9% of graduate/professional students at Cornell live in Fall Creek). The planning board is expected to declare itself Lead Agency for project review this month, with approval in December of January, assuming demolition plans, excavation plans and other needed information has been received and approved. The other new plan to be reviewed this month is for a renovation and expansion of the Maguire Ford Lincoln property at 504 South Meadow Street, just south of Wegmans and the Econo Lodge. Now, for the news savvy, you might be asking, “isn’t Maguire supposed to be moving to Southwest Park?” The answer is two-fold; for one, Ford-Lincoln was not a part of that plan. For two, there hasn’t been much in the way of formal movement on that plan, and the city is hesitant to move forward with a deal because part of the site will serve as a spoils drying area for the inlet dredging, and because of the homeless encampment, which the city would rather not disturb at this time. The evictions didn’t work out so well last time, and members of the Human Services Coalition’s Homeless Task Force are advocating for the city to create a permanent housing solution on-site. What this all means is that Maguire has to focus on its existing properties to keep them modern and fresh for the time being, both by their own requirements and by Ford’s – new car dealers must renovate frequently, since carmakers force them to update or risk losing their exclusive rights to sell new vehicles. 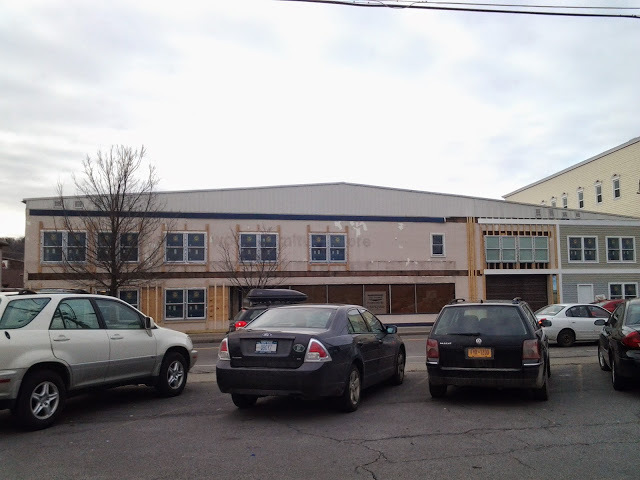 Local firm John Snyder Architects is in charge of design for the $1.5 million project, and while some eco-advocates will kvetch that a car dealer can never be green or sustainable, the building itself is designed to fit Ithaca’s yet-to-be enacted Green Building Policy. The second floor will be expanded with new offices, new customer bathrooms will be installed and the parts and customer waiting areas will be renovated and expanded. The showroom will also be expanded, and it will be slightly closer to Meadow Street than permitted in bib box land, so a zoning variance for front yard setback will be required. As a quick aside, JSA doing a car dealership is an interesting change – usually, car dealership design work has gone to Schickel Architecture. The additions, which will result in a net increase of 5,610 SF, will be steel-framed, with concrete slab foundations, and faced with a couple variations of aluminum metal panels for a contemporary exterior finish. Apparently, that curved thing at the entrance is called a “foil”. Ithaca’s Elwyn & Palmer is assisting with the structural engineering. While there will be landscaping and circulation improvements, and the amount of green space will be increased from the existing site layout, the project will not meet impervious surface zoning restrictions, and will need a second variance to allow the proposed plan. 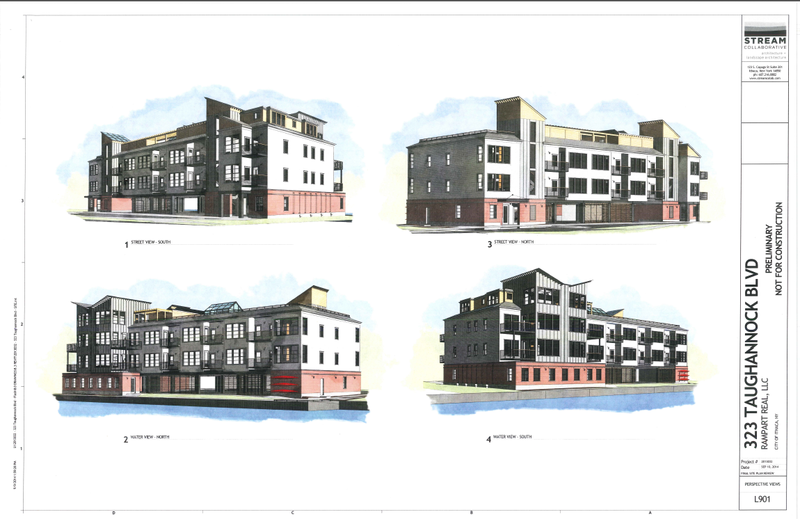 It’s not 100% clear what the proposed design is, since the elevation drawings don’t match the renders. Note the second-floor windows near the service area and the differences in the panel colors and elements (vertical ribs vs. rectangular panels) in the render. The plan is to have approvals by January for a March to September 2019 build-out. Because of a tight corporate deadline from Ford, and since the Board of Zoning Appeals is not having a December meeting, and possibly not a January meeting either (expected lack of quorum? ), the project team wants to discuss some sort of bundling of review and zoning variances in the review. 3. Ithaca-based architecture firm STREAM Collaborative is cooking up their latest project design, and posted hints of this “Net Zero” energy building on Twitter. 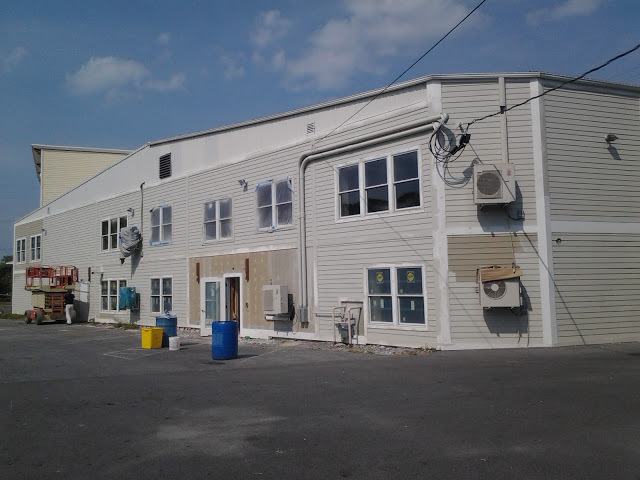 There’s a very high chance this small multi-family Net Zero project is local, given STREAM’s nearly-singular focus on the Tompkins County market. Also, given that it’s a three-story building with what appears to be 4-6 units, I’d take a guess at a more settled, primarily residential urban area. 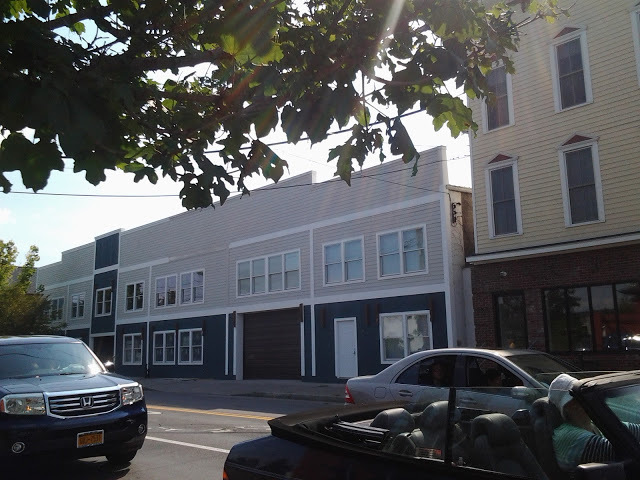 Not Downtown Ithaca, but maybe one of the village centers or one of Ithaca’s more residential inner neighborhoods. If it’s an Ithaca-area rental, given the August-August academic calendar that the local apartment market revolves around, I suspect we’ll see more about this project in the next few months if the developer is aiming for fall 2019 occupancy. 4. Something to keep an eye on for the future. 602 Elmira Road sold for $690,000 on October 24th. Not only was the buyer was a New York-based hotelier, but the price paid is far above assessment – the three-acre parcel was only valued at $150,000, and had sold for $140,000 back in September 2014, from the realtor who subdivided it, to another hotel developer, Guru Hotels LLC. So it’s distinctly possible that Guru Hotels developed a plan, designs and all, but decided to not move forward with it and found another interested hotel developer to take over on the development, which would explain much of the premium on the sales price. Of course, those plans have never been brought forward to the town of Ithaca planning board, so buyer beware. The location has some desirable factors – along Route 13 just beyond city limits, near Ithaca Beer, and within the town of Ithaca’s proposed Inlet Valley agri-business and tourism Corridor. The town as been a bit scattered on how it sees this swath of land next to 13A – the Comprehensive Plan saw it as natural space, current zoning is light industrial, and the Inlet Valley zoning and design guideline study is okay with either of those, an agriculture-related business or something tourism-focused, which a hotel would fit under. Stylistically though, a typical chain hotel will not e approved here – like with the nearby Sleep Inn project, it will have to embrace the ‘rustic look’ the town wants here. 5. 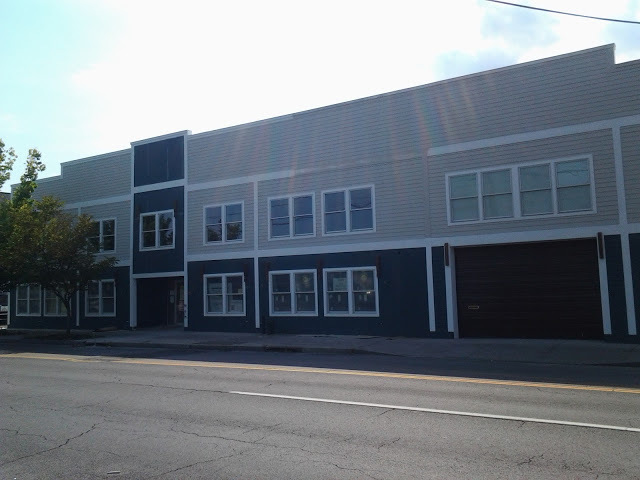 323 Taughannock has its construction loan. 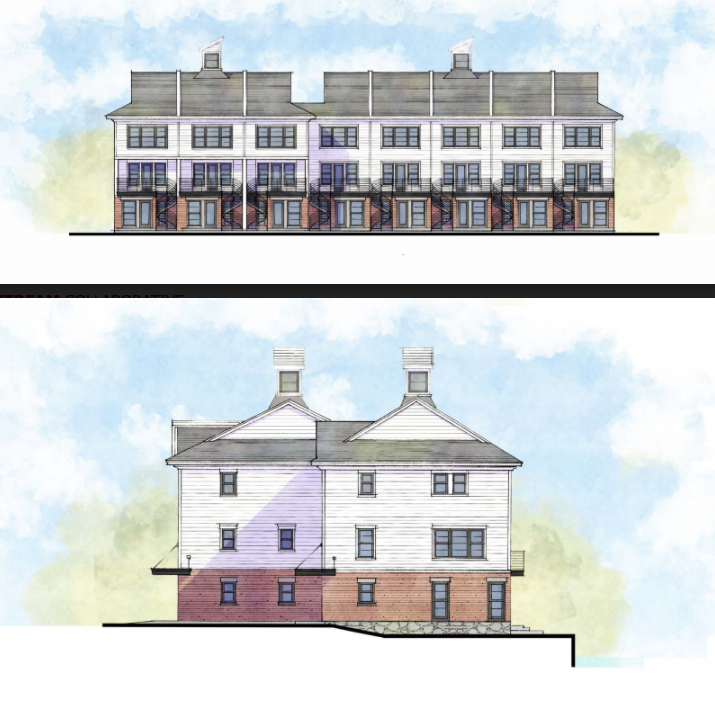 Tompkins Trust Company lent the development team $4.061 million to finance work on the 16-unit townhouse project on Inlet Island. The builder looks like a newcomer – Benson Woodworking Company. 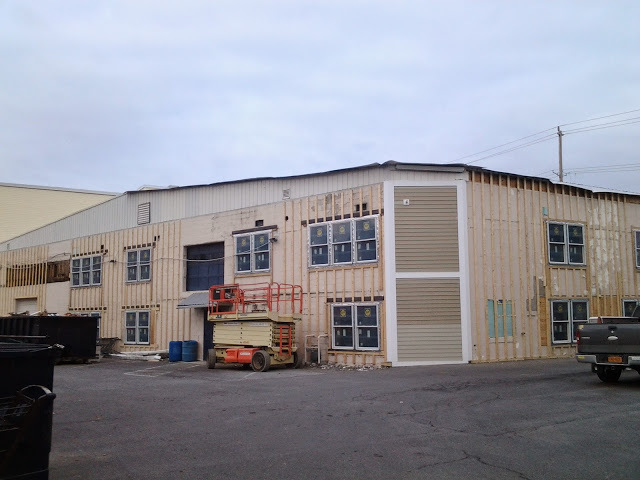 The firm normally does business as a modular and timber-frame builder based out of New Hampshire. I suspect given the choice of firms that the townhouse units will actually be framed and sheathed off site, and transported over to be assembled like pieces of a puzzle. It’s an unusual project for a firm that mostly does higher-end vacation homes and cabins, but 323 is a wood-frame structure, and the project has already had issues with the poor on-site soils and spiraling costs – a modular approach would potentially save on costs and make the logistics of the construction site easier to manage. 6. Cayuga Ridge has also received a construction loan, a set of them to finance its renovation plans. Three loans, for $12,558,750, $2,216,250 and $1,500,000, were received from CIBC Bank USA (the U.S. division of Canadian Imperial Bank of Commerce, based out or Toronto with the main U.S. office in Chicago). The fourth loan, for $3 million, came from Metropolitan Commercial Bank out of New York. The owners of Cayuga Ridge are based out of the New York area, so perhaps that would explain the choice of lenders. The loans cover $19.275 million of the $21 million renovation, which will thoroughly update the interior layout with updated utilities and enhanced patient services. The renovation is expected to result in 49 new jobs at the nursing and rehabilitation center, mostly new nurses and nurses’ aides. 7. 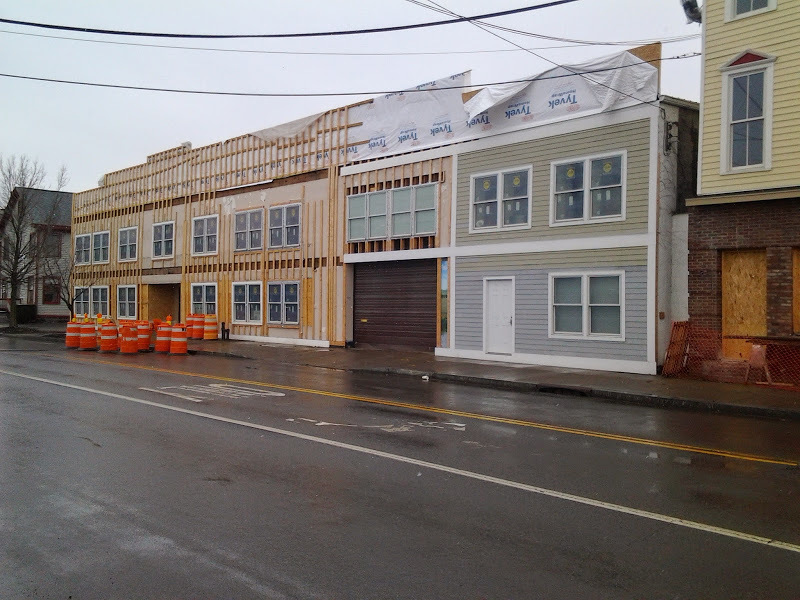 It’s a few weeks old now, but the infill housing behind 310 West State Street is coming along. These are the modular pieces of the new six-bedroom rental being craned into place. 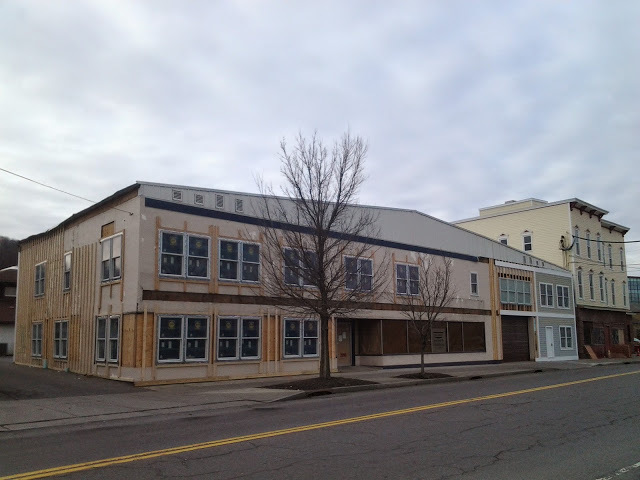 Also, the renovation of 310 West State is coming along, soon to be a “co-op” for young professionals. The renovation to the existing home is being paid for through a combination of private funds and a RESTORE NY state grant, while the rear infill is all private equity. Over on Inlet Island, another project is in the home stretch towards completion. 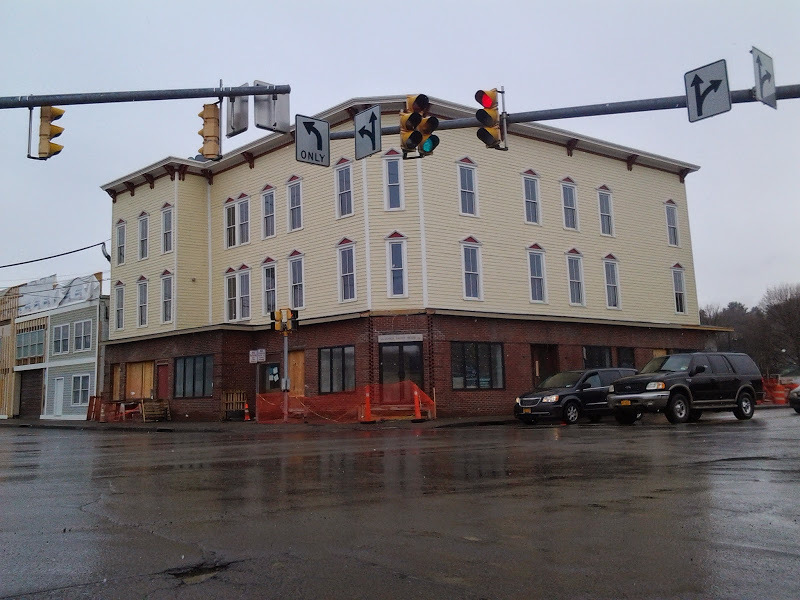 “The Apartments at 206”, Mark Zaharis’s mixed-use project at 206 Taughannock Boulevard, is mostly completed on the outside, with minor cement-board trim installation and painting ongoing. There might be some further exterior work planned with sunscreens and such, but it’s difficult to be sure since the built design doesn’t match the rendering. A peek through the back door showed drywall being hung on the wood framing, and some utilities rough-in still going in. The project is a gut renovation of a former furniture store and warehouse, so the owners had quite a task with rebuilding the interior. According to an older gentleman working on the site, the apartments “should be ready in two or three months, keep an eye out.” There will be four one-bedroom and three two-bedroom units, along with office space on the first floor. Local architect Claudia Brenner penned the design of the renovated building. Last year, Brenner designed the renovation of the Lehigh Valley House next door into a mixed-use building with ground-floor commercial space, donated space for the recently-opened branch office of the IPD, and six condominiums. The Zaharises, who owned and managed the furniture store before it closed in Spring 2014, are the developers-in-charge. 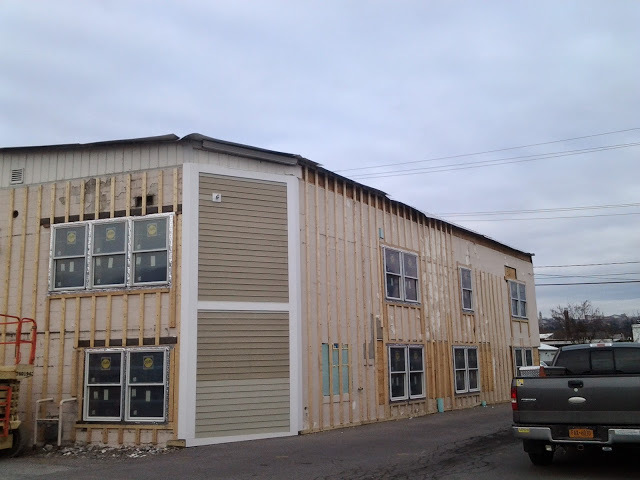 Work has progressed at the site of the apartment project at 206 Taughannock Boulevard on Ithaca’s Inlet Island, where seven apartments and office space are being built from the gut renovation of a furniture store and warehouse. The changes on the exterior have been slow, but given this past winter, the focus of the past few months has probably been on the interior space. 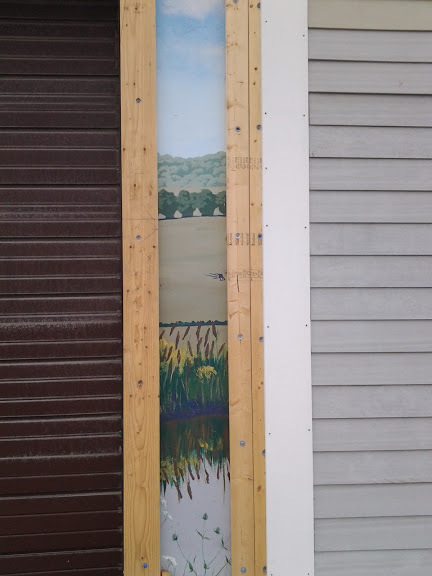 Since November, a little more siding (best guess, fiber cement/Hardie board) had been installed on the exterior, and the industrial steel siding at the front side of the roof has been replaced with an irregularly-shaped plywood-and-housewrap structure. 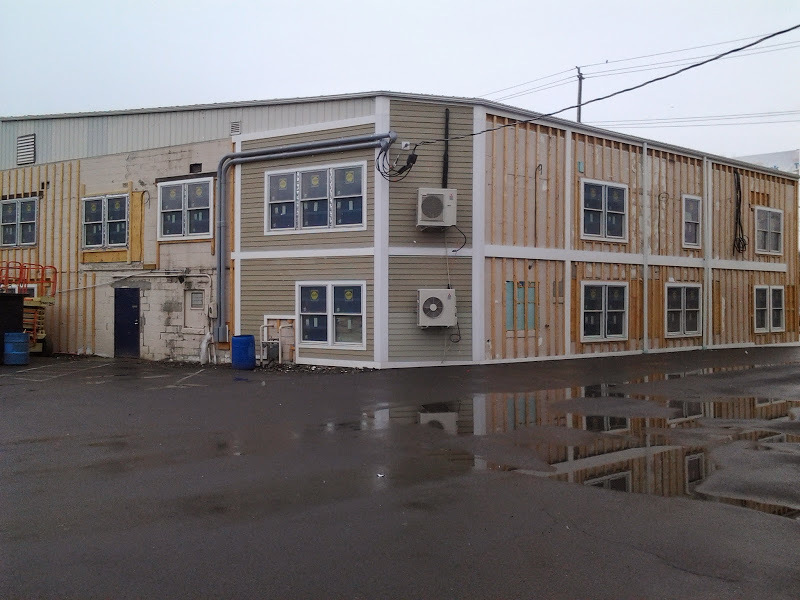 Looking at the window spacing, siding and trim boards already applied to the front of the building, this rooftop re-do is likely intended to break up the bulk of the old warehouse by giving the impression of individual buildings within the greater structure. It could look nice or it could look clunky, we’ll have to wait and see. 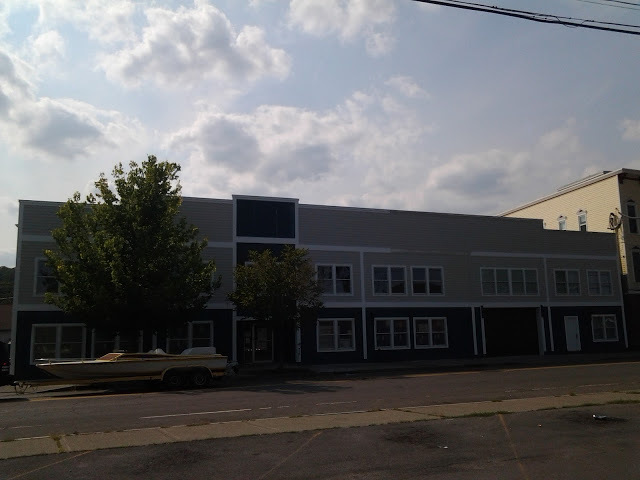 206 Taughannock was until 2014 the site of the Unfinished Furniture Store (otherwise called the “Real Wood Furniture Store“) owned and operated by the Zaharis family. From the county records, the building itself is a 9,156 sq ft structure originally used for retail and warehouse space and dated to sometime in the 1970s. The store closed last April when its owners retired, and a building permit issues a few months later. 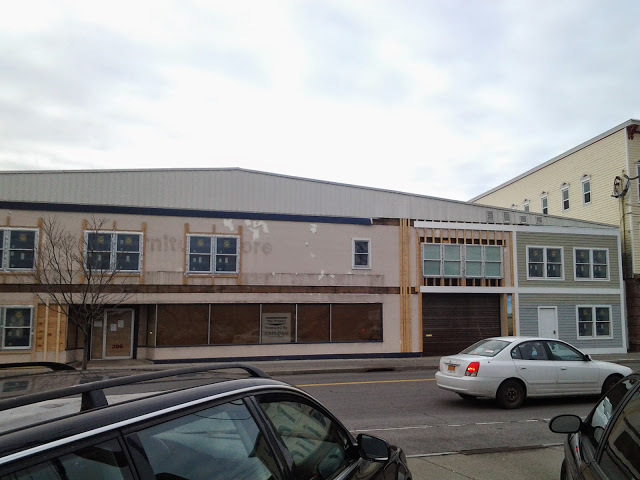 Photos of the store before renovation can be seen here at Ithaca Builds. Perhaps the biggest loss in this renovation is the removal of a rather attractive mural from the front of the structure. 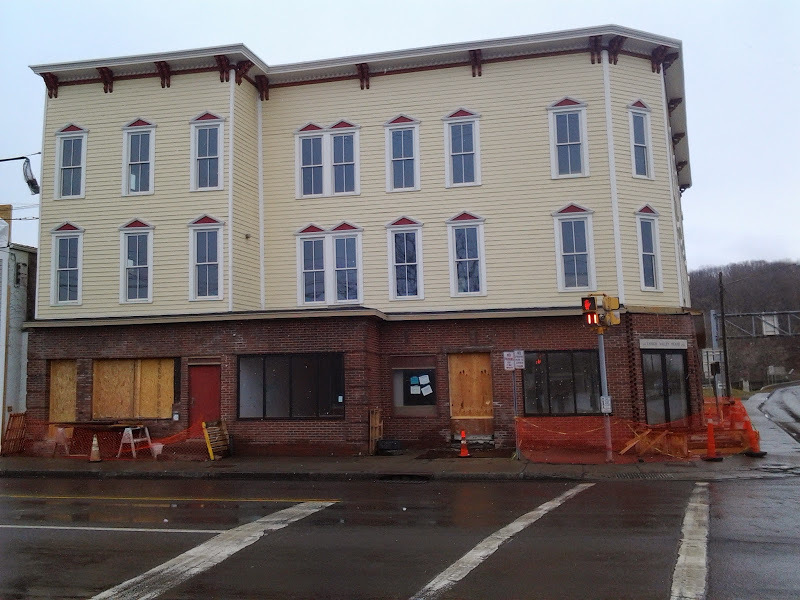 Next door, work continues on a satellite office for the Ithaca Police Department in the ground floor space of the former Lehigh Valley House, now a six-unit condominium. The Lehigh Valley renovation was done by local developer Tim Ciaschi, with design work by local architect Claudia Brenner. Two more Inlet Island projects are waiting in the wings, although only one is likely to start anytime soon. 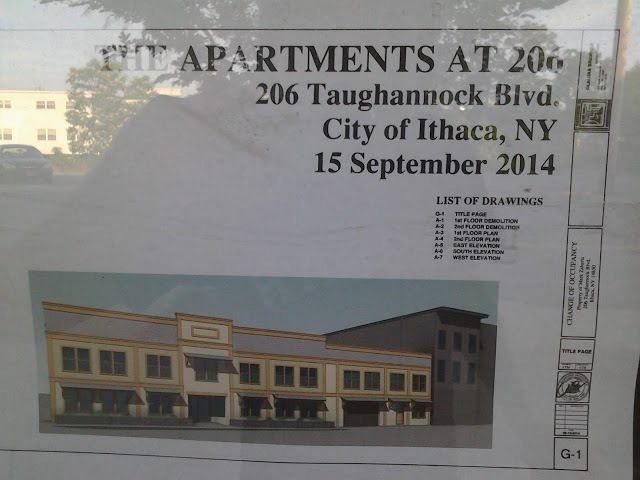 The 21-unit 323 Taughannock apartment project is expected to start construction this year, but no work appeared to be taking place when I checked the site at the start of April. Meanwhile, 12 affordable apartment units have been proposed for 910 West State Street in a project called “The Flatiron”. The developers, Alpern and Milton LLC, applied for affordable housing grant funding to help finance the project. However, the IURA has deemed the project a low priority because it wasn’t feasible as presented. The site as-is is shown below. 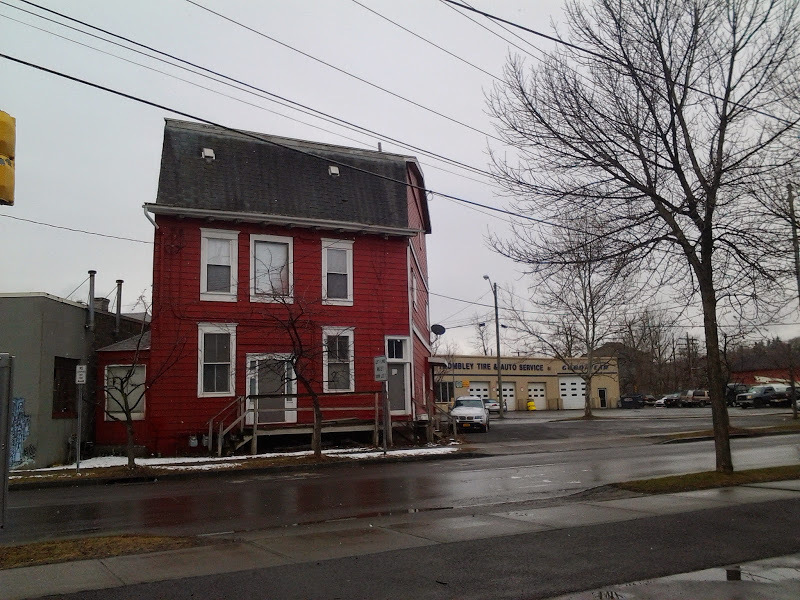 The red building with the mansard roof would be renovated, and a structure of similar height and appearance would be built on the triangular lot to its left (west). Okay, I’ll be completely honest – I don’t know what’s going in here. I don’t know what the mix of uses is, or many residential units there are. Here’s what I do know. 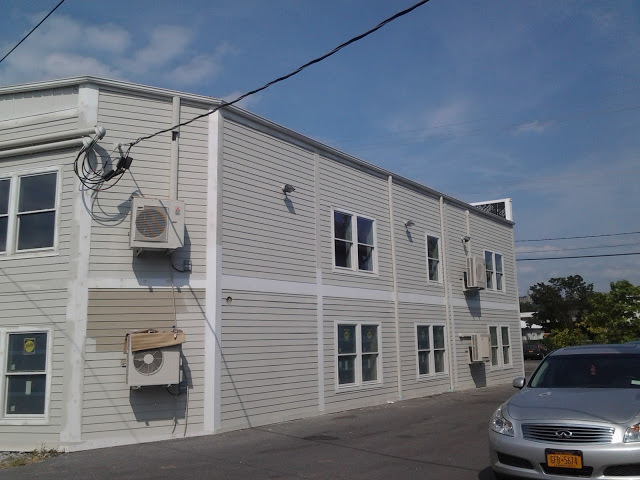 206 Taughannock was until earlier this year the site of the Unfinished Furniture Store (otherwise called the “Real Wood Furniture Store“) owned and operated by the Zaharis family. From the county records, the building itself is a 9,156 sq ft structure originally used for retail and warehouse space and dated to sometime in the 1970s. The store closed in April when its owners retired, and a building permit shown in a ground-floor window was issued in July to the Zaharises. I ran this past IB’s Jason on Twitter, and his guess was about as good as mine; residential units on top and maybe some of the bottom, with a reduced retail space. Photos of the store before renovation can be seen here at Ithaca Builds – the Lehigh Valley House next door is being renovated by its owner (Tim Ciaschi) into 6 condos and ground-floor commercial space. With the 323 Taughannock project approved just up the road, Inlet Island has been seeing increased interest from both current owners and prospective developers. Perhaps the biggest loss is the removal of a rather attractive mural from the front of the structure. The work itself looks like a complete gutting of the original two-story building, with new windows punched into the walls and sedate exterior (fiber cement?) 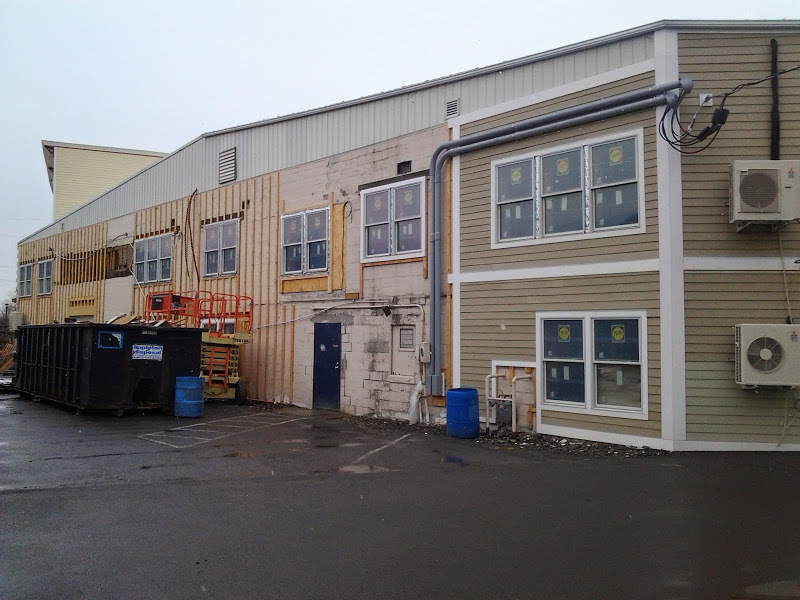 siding attached to the more complete exterior sections. I reached out to the owners but have yet to hear a reply; if anyone has some info to share, feel free to reply to this post or send an email. These projects are the most fun for me, because they go without fanfare, but are just as important as any other project of equal size; they lie in wait for discovery and publication.